completely effective, and environmentally friendly. 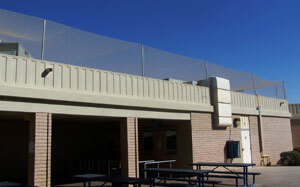 This low-profile netting does not take away from the building's beauty yet provides full protection against all pest birds. Great for façades, ledges, rafters, rooftops, rain gutters, on lights, CCTV cameras, and more. Patented design which is easy to install. Fire retardant for safety, flexible and UV resistant base will stretch over bumps and even go around a 90 degree corner without the need for cutting and joining. "Just roll it out, stick it down and power it up. An innovative line of custom-fit bird and bug screens to keep birds and bugs from getting in through open doorways while allowing your employees to easily pass through. Hot Foot offers several different bird deterrent options to address various nuisance bird problems. In this case study, we provide two different examples of how Hot Foot's Electrack bird repellent system helped remove roosting pigeons permanently, without ever harming the birds. Researchers were losing too many fish in their study to hungry cormorants, swooping in for a free meal. Read how Hot Foot custom-designed a system to reduce the number of fish lost to cormorants down to zero - plus found a new use for this versatile netting. A rail shed used to unload food products was also a busy area for various species of birds roosting and nesting in the girders above - and causing a mess below. Read how Hot Foot custom-designed a system to "spot enclose" roosting areas without interfering with workers. Sometimes our fine, feathered friends are not that friendly at all. Pest birds can cause serious destruction to buildings and property like your eaves, garage, and roof. Roofing contractors frequently report that pigeon droppings are responsible for a large percentage of roof leaks. Their droppings also pose a serious health risk to people, especially children. Hot Foot Bird Repellents provides a variety of safe, effective, and environmentally friendly methods to get rid of pest birds, and keep them away for good. From easy do-it-yourself options like repellent bird gel and Hot Foot Bird Spikes to professional-grade solutions, Hot Foot America is one of the most reliable and effective suppliers in the United States and has been in business since 1977. Plus, we help you at every step. During a free phone consultation, we can help you decide what bird deterrents will work best for your situation, help you plan and calculate your materials, and give you advice and tips about installing your deterrents. If needed, we can also help you find professional installers in your area who will make sure it's done right. Find out more about Hot Foot America or Browse our list of effective, environmentally friendly bird deterrents. Full instructions for installation are included on the product pages, or click here for a list of installation pages. Contact us by email or call us directly at (800) 533-8421, and we'll help you find a Hot Foot installer in your area. Don't hesitate to contact us to answer your question or questions no matter how simple or complicated. With over 35 years of experience we have the expertise on hand. Not all bird deterrents work with all birds. Find out what birds you're dealing with. Wineries have always had a romantic appeal to them, but sometimes they can attract the wrong crowd pigeons. At Mauritson Wines in Healdsburg, CA, a small flock of pigeons tried to take up residence in their crush pad, taking advantage of the structure's angled ceiling with light fittings, pipes, and conduits that gave the flock many nooks and crannies to call home. Birds roosting at this building in Northern California may have been above the courthouse, but they weren't above the reach of Hot Foot and our patented bird repellents. Bird exclusion and bird deterrents are crucial for the wine industry. Not only do birds love eating the grapes, bird droppings make for an unwelcome addition to the vintage... Eco-friendly bird repellents are the best ways to ensure a contaminant-free operation. Pest birds can seriously affect the way you do business. For commercial buildings, it might be the unsightly mess that drives customers away and literally tarnishes your appearance. For industrial operations, birds can cause damage to buildings and equipment - even cause shutdowns in some cases. For companies engaged in food processing, manufacturing, or packaging, there is the always-present risk of health-related issues associated with their droppings, not to mention meeting federal and state regulations. 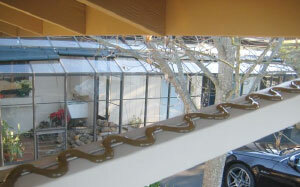 Hot Foot America is the premier supplier of effective, environmentally friendly bird deterrents. From simple solutions such as repellent gel and spikes to more comprehensive options like exclusion netting, post and wire systems, and bird screens, Hot Foot will ensure your area remains bird-free - without any harm coming to the birds themselves. Since 1977, Hot Foot has worked with regional, national, and international companies including Lowes, Hyatt Hotels, Walmart, Ford Motor Company, and 3M, and treated such well known structures as the Charles de Gaulle Airport (Paris, France), and the Emerald Buddha Temple (Thailand) - even the White House and Capitol building. We’ve earned their trust, and we would like the opportunity to earn yours. Contact us to find out how we work closely with companies to ensure they get the right bird deterrents and proper installation for any pest bird problems. A growing trend in the United States right now is for contractors to plan for and install bird deterrent systems as they are building or renovating. It only makes sense - why not stop the birds before they arrive? Hot Foot America works with contractors across the country, helping them determine their problem areas and providing detailed solutions (with materials and cost quotes). Our solutions tend to be extremely low profile, so they are extremely effective at keeping away pest birds yet do not take away from the architectural beauty of the buildings being protected - and we’ve worked with some of the most beautiful buildings in the world including the Spreckels Temple of Music in Golden Gate Park, San Francisco, the Tsukiji Hongan-Ji temple in Tokyo, Japan, and the US Capitol building. It is also important to note that our solutions are 100% environmentally friendly, and do not kill or otherwise harm birds in any way. Depending on your construction project, using Hot Foot products may also increase your LEED points, especially in the areas of improving air quality and employee health. Contact us today for a free consultation to find out how we can help you plan and implement an effective bird deterrent for your next construction project. Sticky goo that birds hate stepping in – like mud in boots! Great for DIY and professional solutions. Does not harm birds. Literally a barrier between birds and their roosting areas. Strong, weather resistant, and near invisible to keep your building beautiful. Stainless steel spikes that protect natural roosting areas from pigeons and gulls. Low profile and weather resistant. Very low amperage, low visibility bird repelling system with a flexible track. Solar, 110 volt and 240 volt power supplies are available. Spring-loaded cable system that creates an unstable landing spot for larger birds, forcing them to roost elsewhere. Hot Foot Mist Nets allows you to safely capture and release pest birds in enclosed areas without injuring them. Capture and relocate pest birds from any area safely and humanely, inside or outside. Ideal for rooftops and other open areas. Keep birds and bugs out, but let employees and equipment pass through easily. Innovative, customized solutions for any size doorway from locker to hanger. Allows you to install and affix many Hot Foot products to any material including stone, brick, wood, and concrete. Birds spread disease to humans through their droppings. Eliminate the problem before you start your cleanup with Hot Foot disinfectants.